WOONSOCKET, R.I., Sept. 7, 2017 /PRNewswire/ -- CVS Pharmacy, the retail division of CVS Health (NYSE: CVS), today announced that the company is introducing automated retail vending machines stocked with convenient, on-the-go necessities including over-the-counter health products, "better-for-you" snacks and popular personal care products typically sold at CVS Pharmacy locations nationwide. The new vending machines are designed to help maximize convenience and meet customers where they are with on-the-go wellness solutions outside the traditional retail space. "We are always looking for new ways to combine convenience and innovation to help better serve our customers," said Judy Sansone, Senior Vice President of Front Store Business & Chief Merchant at CVS Pharmacy. 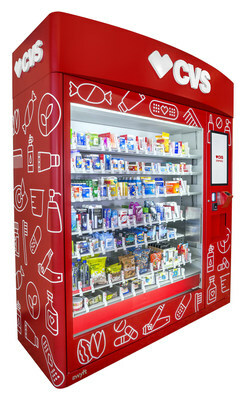 "Our new CVS Pharmacy vending machine program allows us to extend that convenience beyond our brick-and-mortar locations to offer customers on-the-go essentials in the locations where they often need them most, like airports, hotels and other transportation hubs." These machines enhance customer convenience with strategic placements in areas well-trafficked by local residents and travelers alike who may need products in a pinch, eliminating the need to make a special trip to a retail location. CVS Pharmacy is also considering an additional 50+ locations throughout the country including college campuses, corporate offices, hotels and other transportation hubs to host vending machines in the future. 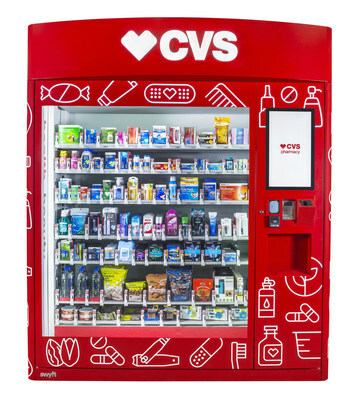 "These new vending machines allow us to make our innovative CVS Brand products available to customers outside of our store locations for the very first time," said Cia Tucci, Vice President of Store Brands and Quality Assurance at CVS Health. "The CVS Pharmacy vending machines will be located in places where we can bring our customers smart solutions and convenient access to the products they trust when they are on-the-go." To help customers navigate this new shopping experience, the vending machines, will feature a 22" multi-touch screen, high resolution images with expansive product information and a QR code reader to read barcodes and promotional codes. The machines will be ADA compliant, allowing those in wheelchairs to fully access the touchscreen and its functionality, and will accept all major credit and debit cards. CVS Pharmacy is a trusted health and beauty destination for more than 5 million shoppers every day. The new vending machines, along with recent nationwide store design enhancements and expanding digital programs, represent the company's ongoing efforts to evolve the retail customer experience in stores and beyond. With this pilot program, CVS Health adds to a growing portfolio of innovative services including CVS Curbside Pickup, CVS Pay and digital pharmacy tools available through the CVS Pharmacy app, that together build on the company's enterprise mission to help people on their path to better health. CVS Pharmacy, the retail division of CVS Health (NYSE: CVS), is America's leading retail pharmacy with over 9,700 locations. It is the first national pharmacy to end the sale of tobacco and the first pharmacy in the nation to receive the Community Pharmacy accreditation from URAC, the leading health care accreditation organization that establishes quality standards for the health care industry. CVS Pharmacy is reinventing pharmacy to help people on their path to better health by providing the most accessible and personalized expertise, both in its stores and online at CVS.com. General information about CVS Pharmacy and CVS Health is available at www.cvshealth.com.